The advent of smartphones and apps has led to a variety of creative new businesses which are reinventing how we shop, work, and communicate. They’re also changing how we travel by bringing private aviation to the masses. Some of these concepts, like SurfAir, seem to be doing well, while for some reason east coast equivalent Beacon never really got off the ground. Others — Flytenow and AirPooler — were quashed by FAA determinations about their legality. It was probably inevitable that this phenomenon would make it’s way into my own flying life. 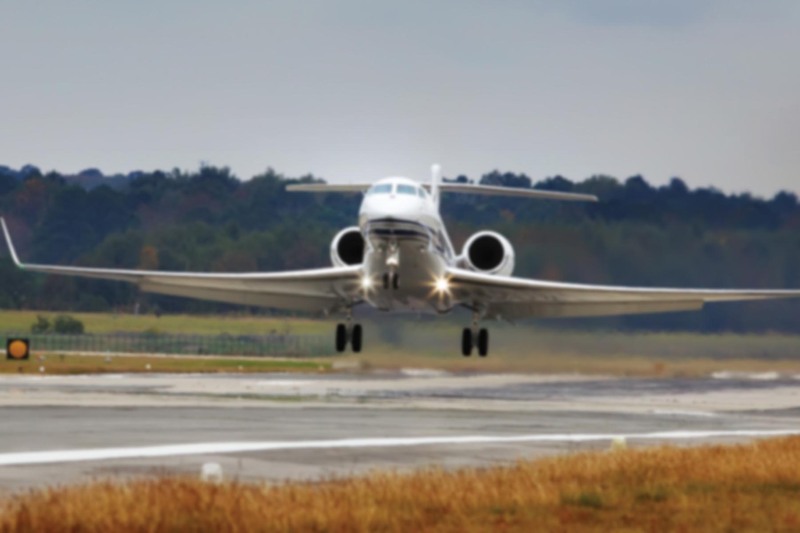 The company I work for has entered into a partnership with JetSmarter, a mobile marketplace for private jet charter that the Wall Street Journal described as the “Uber of the air”. We’re flying scheduled service between the coasts and other major cities as part of their “JetShuttle” program. Instead of chartering an entire airplane, you can now book a single seat of your choosing. I’ve done a few of these trips so far and the passengers seem delighted with the ability to avoid most of the hassles typically associated with air travel and large hub airports. A business jet’s interior looks more like a living room than a typical airliner, so it tends to facilitate discussion and interaction between the passengers. Flight attendants have told me that by the end of the flight, strangers have become friends. And some business connections are probably being made as well. 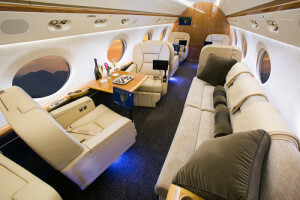 A typical Gulfstream interior. This layout isn’t just more comfortable — it’s also designed to facilitate discussion and interaction among the occupants. The JetSmarter membership isn’t cheap. It costs $9,000 annually and requires a $3,000 initiation fee. On the other hand, when you compare it with the cost of chartering a large cabin business jet for even a single cross country flight, the price seems downright thrifty. It’s even competitive with first class airline travel, especially for those who travel frequently. At first I wondered how this sort of thing would be legal. Wouldn’t scheduled service require a Part 121 certificate? Apparently not. JetSmarter’s model has been validated under 14 CFR Part 380, which requires those who wish to arrange public charters to have their prospectus approved by the Department of Transportation. JetSmarter doesn’t operate the aircraft or have “operational control” over the flights; they simply help facilitate the placement of individuals onto an approved Part 135 certificate holder’s airplane. In that regard they function more like a broker than a charter company. Incidentally, brokers are not regulated by the FAA, DOT, or anyone else that I’m aware of. I never would have expected to be flying scheduled service while working in the charter industry, but that’s the sort of thing you get when disruptive technologies begin to work their magic. It blurs the lines between what we traditionally think of as airlines and charter companies. For most folks, the primary distinction has been the fixed schedule of the former versus the non-scheduled, or “on-demand”, nature of the latter. But times are changing, and the aviation industry with it. I can think of several other examples of this phenomenon. I learned to fly about 20 years ago, and back in “the day”, a training airplane was almost invariably a 152/172 or Cherokee of some kind. Oh, you’d find the occasional Tomahawk or Citabria in use for that purpose, but for the most part it was a Skyhawk/Cherokee game. Today’s trainers come from an impressive fleet of Diamonds, Cirruses (yes, people do learn to fly in them), prototypical Cessnas and Pipers, and more LSAs than you can shake a stick at. If my experience is any indication, tailwheels are seeing a resurgence in training roles—something regular readers of mine will know I’m happy about. And there are probably ten thousand more homebuilts are out there than when I took my first flight. Do I even need to mention about how the general aviation cockpit has changed over the same period? In the corporate aviation world, we’re seeing the first hints of supersonic aircraft on the horizon with the Aerion AS2, Spike S-512, and whatever Gulfstream has got up it’s sleeve after partnering with NASA, Sukhoi, and parent General Dynamics. JetSmarter also made a deal to purchase my company’s empty charter legs for the next few years. Traditional charter flights are priced round-trip, because even if the passengers only want to fly one way, the company has to get the plane back to its home base. The ability to offload those empty flights to a third-party for resale helps the bottom line and connects passengers with flights that meet their needs. Any way you slice it, this is an exciting time to be part of the aviation world. I can’t help but wonder what they’ll think of next.